One of this site’s recurring themes and criminology’s iconic trappings, the poison arsenic carried off many a soul. Poison has been around forever, of course, but “inheritance powder” was a slow-motion moral panic in the Victorian years — when a man on the make could be imperceptibly nudged into an early grave by a friend or a spouse or a maid using a product that could be had for pennies from the local apothecary. Who can feel safe, when little old ladies could make a murder spree of afternoon tea? 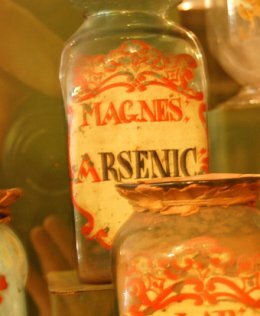 For the next several days, we’ll remember a few of the arsenic era’s more notable nudges … and a few of the distinct minority of poisoners who found that stealthy powder equally fatal to the hand that stirred it. Arsenic photo (cc) image from Curious Expeditions.